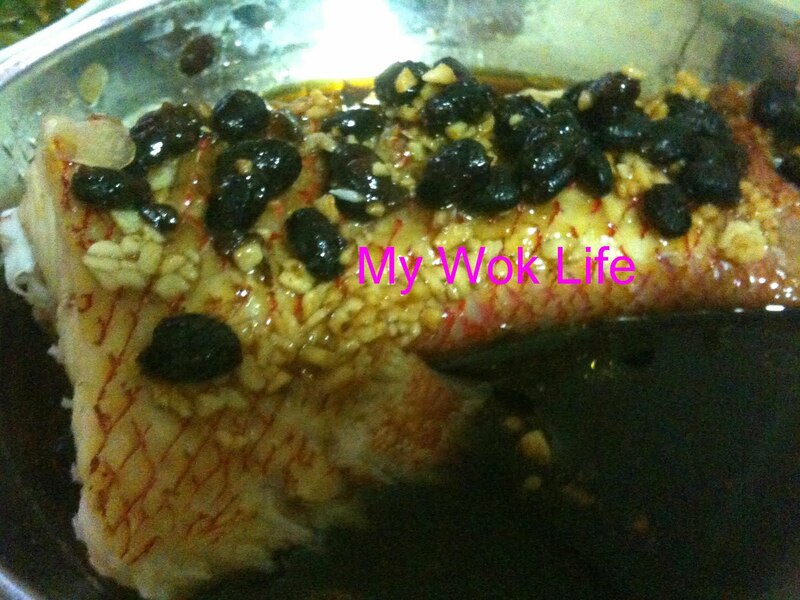 Yes, I do like steamed fish with whole black bean for its delicate briny flavour. And of course, steamed fish is the heathier choice on the plates. I used fish tail instead of fish head this time. 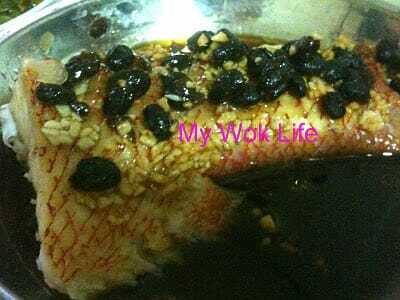 It’s simply personal preference of more fleshy portion while fish head is definitely good in this recipe, too (I usually use fish head in curry recipe.. smile). 1) Scale, trim and rinse the fish. Sprinkle salt and pepper on both side of the fish and season for 15 minutes. 2) Mix ingredients (B) into a small bowl. Combine well. 3) Heat wok with oil over medium fire. Add ginger shreds and fry till fragrant. Heat off and pour in sauce mixture. *Beware of sizzling oil. 4) Quickly transfer the hot sizzling sauce and pour onto the seasoned fish. Sprinkle whole black bean (which pre-seasoned with sesame oil and sugar as abovelisted), and minced garlic on top of the fish. 5) Now, steam fish in a steamer or on a wire rack in wok (filled with quarter of water), for 15 – 20 minutes, depends on the thickness of the fish meat. Garnish, if desired. Serve immediately. A serving of this steamed fish counts about 150kcal. Variations: If use fish head, steam using the same time length. *If prefer fish fillet to other parts, reduce steaming time to just 10 minutes will do. I liked fish fillet the most, in fact, especially for small family of 2 – 3. Tips: Fish must be really fresh. Clean and keep fish in the refrigerator right away when back from market till preparation time. * Choose fish from sea to river (fresh water) to eliminate any possible chance of muddy taste in your steam. * You may skip the Step (3) of heating sauce mixture before pouring onto the seasoned fish. Simply pour the unheated mixture and top the ginger shreds on top of the fish together with the whole black bean and garlic. Then, bring it to steam. This will create a milder flavour of this steamed fish dish.